More than 4,000 tonnes of concrete are being poured into the ground on Brighton seafront this weekend to create the foundation for the i360 viewing tower. The milestone in the building of the 162-metre i360 has involved a steady flow of lorries arriving every five minutes at the site since the early hours of the morning. They are bringing more than 2,000 tonnes of concrete today (Saturday 30 May) and pouring it into a huge reinforced hole with a fenced space in the centre for the i360’s shaft. There will be about 200 lorry visits to the seafront site today from plants in Shoreham, Burgess Hill and Chichester. The Brighton i360 spokesman said: “A weekend date was picked for the pour as so much concrete is needed, the i360 team had to pick a day when they could have sole use of these three plants, as most other building sites are closed at weekends. “Each lorry is emptied in a just a few minutes and the concrete takes around two hours to set. “As each lorry arrives the concrete goes into a pump tray. It is then hosed in by one of three pumps. “The concrete will form the foundations of the tower. There will eventually be four pours in total. “The second major concrete pour will happen on (Wednesday) 10 June once the first batch has had time to cool and then smaller ones on 11 and 12 June. 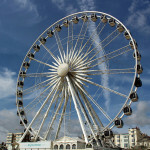 Brighton i360 chief executive Eleanor Harris said: “This is the exciting moment we have all been waiting for. “Once the foundation is in place, we can start building the world’s first vertical cable car. The tower will start going up on (Monday) 15 June. “Contractors from Hollandia in the Netherlands and local firm Mackley are supervising the project. “There are 50 to 60 construction workers on site and 10 marshalls to make sure everything runs safely and according to plan. All is going well so far. 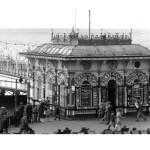 “The team has worked closely with Brighton and Hove City Council to make sure traffic is not affected by the activity today. “All the trucks are being managed from a holding site at Shoreham Port and truck departures are being carefully staggered to make sure they do not have to queue up on the seafront but instead have a steady arrival throughout the day. “If you visit the site today, you will see the trucks arriving at the Peace Statue and then making their way along the i360’s ‘construction road’ on the beach. “The Brighton i360 community team are on site all day sharing information with the public and hosting a visit from children’s TV favourite Bob the Builder. All this is in preparation for the arrival of the steel “cans” that will make up the viewing tower. They are due to arrive in two barge shipments from the Netherlands directly on to the beach beside the site by the West Pier, weather depending, with the first barge arriving on Thursday 11 June. The Brighton i360 spokesman said: “It will take two to three days to unload each barge delivery and during this time the team will need to fence off and patrol a larger section of the beach and water to ensure they comply with health and safety regulations. The attraction will incorporate a 400-seat restaurant, a shop, children’s play zone, exhibition space, tea rooms and conference and event facilities. 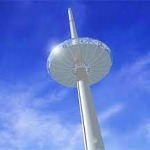 Cannot wait for i360 to be built. Not sure how environmentally friendly 4,000 tonnes of concrete is? Should have expected this to be approved by the apparently ‘green’ council. The Annual East Sussex/Hove and Brighton Aggregates Report is very interesting on the way in which materials are taken from the land (and indeed dredged to keep the Harbour open). Well worth reading, excellently written.